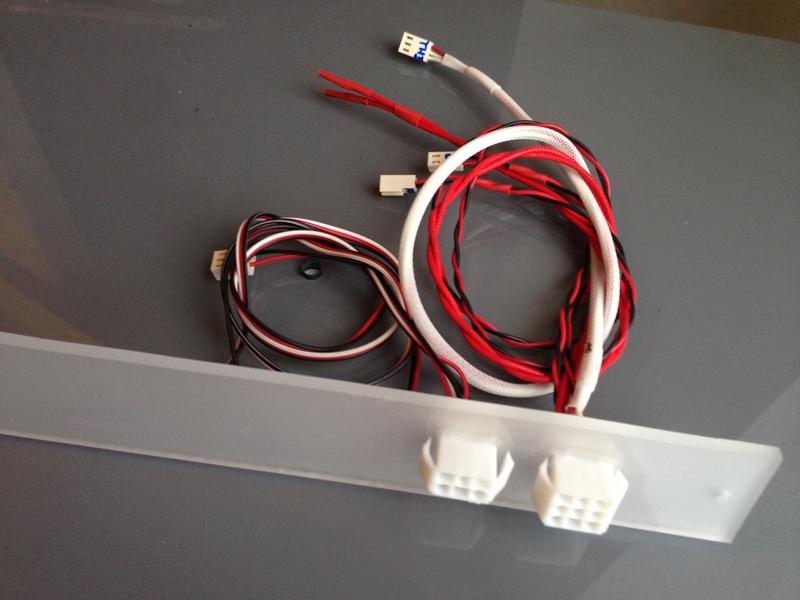 You might have read my part 3 where I had a section on installing LEDs. Here are some thumbnails from the previous post. This blog-post is all about getting it to work, including installing a front-mounted simple mechanical switch. Getting 12v in 24v system? I had a hope the small on/off switch could be placed as you see on the photo. I removed the bracket, measured up, and drew some lines. I made 0,5mm extra space between the switch and extrusions – giving me some margin of error to work with. After I had it going I switched to a more sturdy drill and worked on it. Using plenty of cutting oil and cleaning away aluminium parts all the time. I used a tray as a drill-platform as I do not own a proper workbench (I have a small portable one, but it was packed away). I’ve put it over the sink in the kitchen. Worked great as the metal parts just ended up in the sink, and the drill didn’t go down into a tabletop or similar. After finishing the pilot hole I measured the diameter I needed for the switch and used the right sized drill for the job. The on/off switch is within the bracket, so that’s as planned. I had previously used the switch, so allready had in and output wires on it. I use the male plug (2 exposed pins) as input and the female connector as output. Doing it like this, so any wires/plugs with active current is not in the form of bared metal pins. I took a photo of the small hand tool, as that is enough of a tool to crimp on most connectors. A proper crimping tool is prefereble, but if you only need it for 1 project it is fine to skip buying it. So, the next step is to get 12v in my 24v system, as the LEDs are running on 12v. The Duex5 can be configured to output 12v, so I might go that route eventually, but I’d like to initially have power available to the LEDs as soon as the PSU is on, regardless of setup. I’m using a small “hardwired” 24v DC to 12v DC step down. It can even output at 3amp, which is a lot for such a small thing! I like these things compared to the one you adjust manually, as they never put out that annoying high pitch coil whine you sometimes get from “normal” DC-DC step down modules. Photo shows front and rear of the board. I’m going to solder on small pins, as I’m not sure what I want in the longer run regarding these. Alternative is to just solder on the wires. Using the foam pads to keep the pins in place while soldering them on. Ready, get, set go, and finished. The fan is homemade with a carbon filter.. it’s really super nice. I’m using standard female dupont connectors and just using standard tools. I have a super nice Lambda Vega-Lite 550 powersupply I found at a bargain price. Going to convert it into a proper “lab psu” at some point with banana plugs etc. I’m making sure the output is in fact 12v and not something else. Putting the wires in place using duct-tape (untill I can print some other cable-management things) and mounting the small Step Down below the Duex5. I’ve just used double-sided tape for now, and have not wired it up any further.. propably going to be directly hooked up to the PSU though. This should had been in the previous post, but since I didn’t take any photos of it, I do it now. You can see how the power input comes up through the floor paneling through a small indentation, and each section of the LEDs are conneted using a small piece of wire. I’ve put white heatshrink over the exposed solderpads. 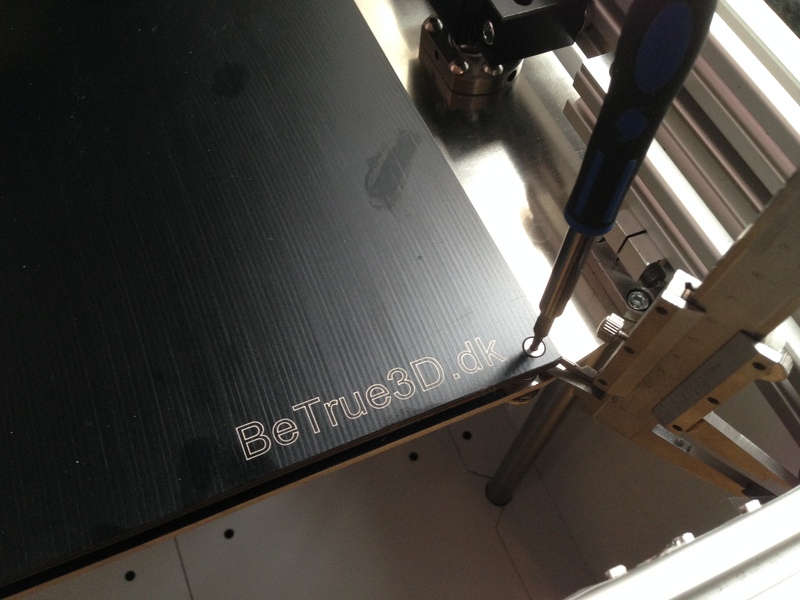 It might be hard to see, but here are 2 photos showing the BeTrue3D Printer with LEDs on and off. This post is about my brand new super nice PEI-Coated black oxidized 5mm aluminium plate with lasered logo/url and about a lot of wiring I’ve spent time doing. I also put in the last paneling. I ran out of the white 5mm card board material and am using some whiteish acrylic I had untill I can get some more of the white plates. First up is the printbed. This is the single most expensive item in my printer at around €85 including shipping! Especially when combined with the 500w AC heater at around €35. You can get the plate much cheaper if you get it in natural color instead of black though. Here’s the finished result, which I’ll go through in steps, to show how I did it. 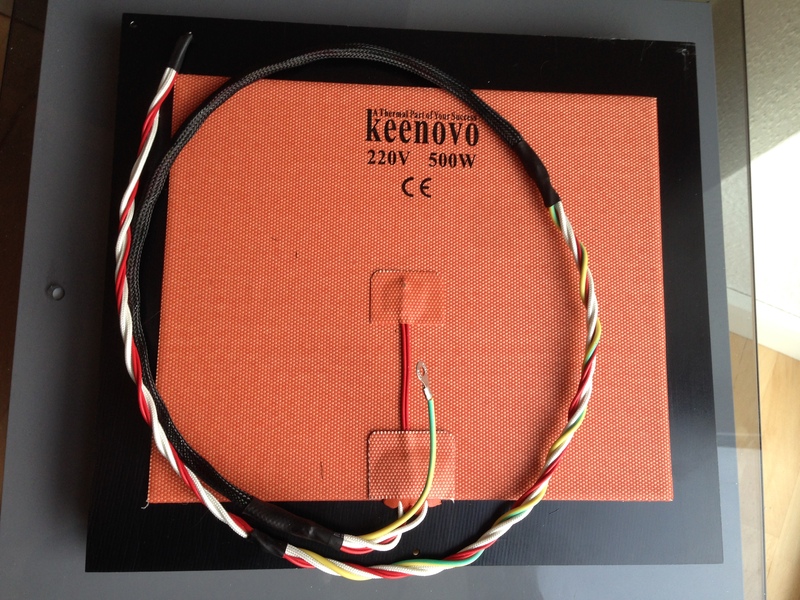 I’m using a 500w AC heater from Keenovo. You can get it in custom sizes at no extra prize, and they really deliver high quality. Included is 1 big pad of preapplied heat resistant and -conducting 3M MP486 tape, which is the best for the job. I wanted to ground/earth my Z-gantry directly, in case of a mishap, so needed an extra wire. I also enlarged one of my 3mm holes to 4mm to make it fit perfectly. I drilled an extra small hole where I can zip-tie the cables onto the lift-plate for stress-relief for the wires/headpad. It is places so the wires does not grind on the edge of the plate. I originally wanted to use a cable drag-chain, so hadn’t planned on using zip ties. I braided the cables and sleeved the part that’ll be visible ind the print chamber. I do not insulate the bottom of the plate, as I want the increased heat output to act as a sort of “passive” heater element for the heat-chamber effect I’ll get by doing this. 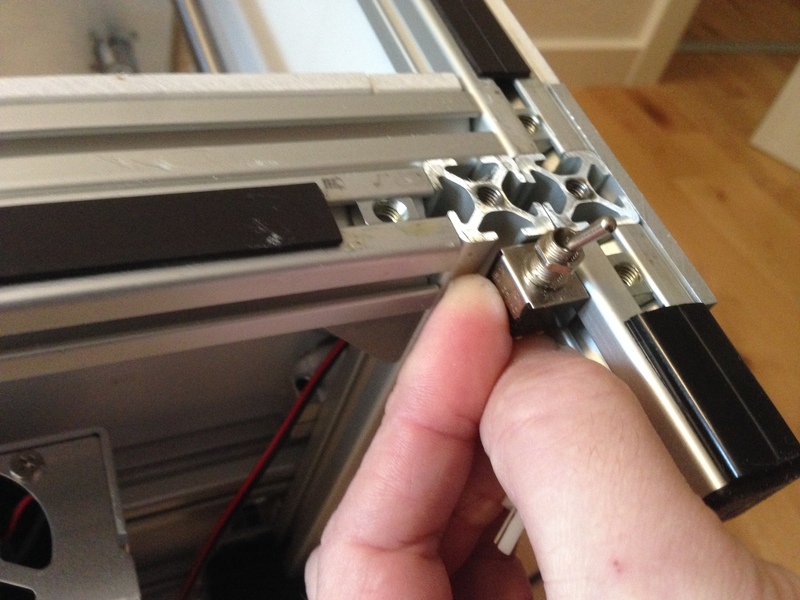 I’ve planned to use the Ultimaker 2 fingerscrew system. I really like it, as it is discreet and runs very nicely, while at the same time can be tightened down really tight so the bed doesn’t wobble. It means I’ve had 3 holes at 6.5mm made in the lift-plate for the fingerscrews, which lines up with corrosponding countersunk holes on the print bed. The fingerscrew assemblies are made up of the fingerscrews, spacers, springs and m3 scews. For best result I have put on lithiumgrease between the fingerscrews and spacer, and again on top of the spacer. Note: I’ve used some other types of grease on other printers with great result as well, so no need for special grease. Just use something. After fixing the cables at the back edge of the bed, as shown in photo a bit above, I placed the springs at the right spots, and placed the bed on top of them (took a bit of balancing in order not to knocking around the springs with the plate). The springs are 20mm long and has an inner diameter of 7mm. I used a caliber I can lock into place and put it at 10mm. This means I can do a rough calibration of the bed. It’s not precise, but close enough to start calibrating using printer software. Note: The distance I used might not fit on other printers, due to thickness of plates and length of m3 screws and springs. So tighten down the springs untill you can depress the corners with your fingers, but not so easily that the bed can wobble. The springs must be tightened down good, but not all the way. The give in the sprigns is an insurance if you accidentailly have the hotend smash down onto the plate. If the plate can’t move, something else is likely to break. I originally wanted to use a dragchain… but I’m just not that big a fan of them, and found it looked bulky in there.. even a thin one. I know this is a subjective view, but there it is. I liked the sleeved version I made, so stuck with it. I drilled an 8mm hole for the wires to get out to the back compartment, along with 2x 3mm holes for a ziptie to hold the cable in place. The cable can flex up behind the z-stage.. even if it wanted to get under the bed, there is plenty of space for it in there, so it can’t cause any troubles. I couldn’t get good photos of cables out back, but one of the AC wires went to the Load side of the SSR module at the connector labeled 1. The other AC cable went to my PSU at the AC N connector. The Ground/Earth cable went to the AC earth connector, while the 2 thermistor wires went to the bed thermistor. So much wiring when custom building printer! As I created a connector plate for the 5 extruder motors, I did the same for my wire harness going to the carriage/hotend. It’s a LOT of wires for sure, but they are needed. The 6-pin plug to the left is for BLTouch. 2 of those pins are for z-min and 3 for servo. 1 is unused. The handdrawn “labels” are meant for my reference untill I get it working. I plan on printing some nice versions at some point. Here we can see how the new connectors looks; with and without the matching wire-harnesses hooked in. I havn’t put connectors on the far end (at hotend) which’ll wait till I get the last parts I need to make the Y axis and carriage in order to make the correct length. 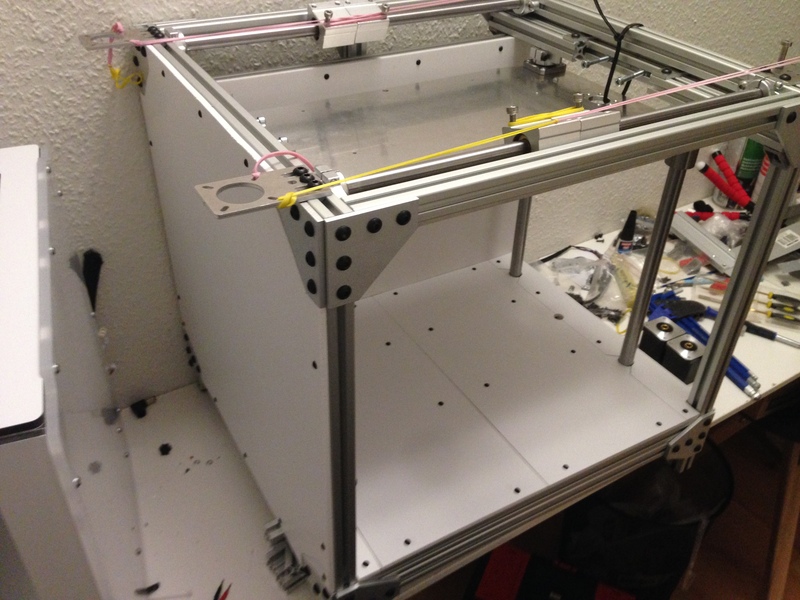 Time for a new blogpost on the build-process of the BeTrue3D Printer, since last. I’ve kept my facebook users updated, via regular posts to my facebook page, but it has mostly been photos, while I’ll explain what has happened and talk about the decisions made in this post. Lets start by looking at the status right now, and see if it matches my projected result. I’d say it’s a success. Means I was either lucky my planning worked, or that I was thorough when doing my design and planning. I prefer to pick the last one. I AM going to make a complete BOM (Bill Of Material). I had created a parts list, on my open builds page, but it disappeared since I worked in 2 tabs at the same time, which isn’t working for that site. I did create a small youtube video when unpacking the big box of goodies from RobotDigg, where I bought most of the parts aside from alu-extrusions and metal rods. Here you can see the incredible nice hollow Nema 17 motors along with the bespoke 1204 300mm ballscrews and BF10 part used to fixated the ballscrews in the top. I don’t need support block near the motor, as the shaft goes through the motor and is fixated in the bottom, as you can see from the images. This is one of the few custom items I’ve had made for this project. I simply just had no way of making this myself, but was lucky I found someone who could manufacture it for me. I learned a lot doing this project. Not least that it’s important to mark it m3 and not ø3 when I wanted a hole with threadding. Meaning mark endresult and let the professional figure out the hole-size, unless you want to do the threadding yourself. After recieving it, someone asked me if I wanted to use motor-alignment on z-axis! Uhh? I talked some to the maker of RepRapFirmware and was told he planned to add this in a later firmware version, so I decided I’d make mine compatible for such a day, which meant I had to make a hole for an additional long m3 screw to hit a second z-max limit switch to facility this motor-alignment thing. I had one last thing I needed modifying, as the hole for the ballsc were 21,5mm and the ballscrew actually ways 22mm, so had to enlarge it slightly. This is the second custom item for the BeTrue3D Printer build. I had a PEI-coated, black oxidized plate made with a “logo” lasered onto it by clever3d.de. Note: Price is much higher as soon as you move away from natural color. Lasered logo is only like €3 though! He makes custom sizes at no extra charge, so it’s perfect for any printer project. He also offered to make the z-lift plate at a resonable price, which I would had taken if I hadn’t found one nearby who could do it for me, so this is a nice source for custom aluplate work. It looks absolutely awesome! unfortunately the rear hole was not completely centered. My plate is 29cm long and the hole should be at 14,5cm, but was placed at 15cm. Guess the mechanic just had a 30cm plate in mind, when he ‘centered’ the hole. While I was rather bummed by it, Frank from clever3d.de set right out and made me a new one without complaining, which is incoming now. I did not have to return the faulty plate, as some shops insist on doing, which is a huge bother. In my last blog post I talked a lot about dimensions and why I did what I did. One thing I didn’t talk much about was the reason for the 2 layers of alu-extrusion bars at either end, up top. I did it in order to maximize the XY plane, as the sliders can slide in over the mechanics of the Z-stage. Doing it like this also ensured I had some flexibility on the placement of the bars fixing 16mm rods in place, without compromizing the rest of the structure, as these rods might vary a bit in length. I have used 12mm rods for the X-axis to avoid any bending. I can bend the 8mm rods in my Ultimaker 2 machines using a finger deemed 8mm too small for longer runs. I couldn’t be sure about 10mm so went with 12mm. I’ve used 2x SCS12UU with bushings for each side. They each have a selfgraphite block instead of ballbearings to reduce noise and to raise accuracy as well. I’ve heard this quite a few times. And yes, you can say it is. I’ve done it for a reason though, which is an attempt at ensuring squareness and rigidity. I’ve had multiple checks build in, meaning if one thing doesn’t fit, it means something is wrong in a differnet place.. meant a lot of time putting it together, but also that I had some “early warnings” if I had done something wrong, and could fix. Even aside from the build in “fail-safes” I’ve added a lot of extra aluminium bars. To be more exact, I have 4 extra at the “floor” and 1 extra at the top almost- rear. Alle these bars are put in place to mount panels and electronics on, and also to hide facility the wiring in an orderly fashion. I used the bars, as it was a cheap and easy way to do it since I was ordering a lot anyway. I originally planned to have some acrylic plates lasercut, but I decided to cut some costs and make some myself. While browsing for material to use, I stumbled across some nice “hobby plate” made of 5mm thick white paper material. It’s pretty sturdy, but very easy to cut and much cheaper than anything else I looked at. The big job of mounting electronics started. I had the PSU placed in the center, but since the GND on the Duex5 to psu must not be longer than 100mm, I moved it to the side, for shorter wirering. I also modified the space between the Duet WiFi and the Duex5 in order to accomodate the wide connector cable between the two. I didn’t use the ferrules that came with the board as I simply just couldn’t get them right. I even bought a special tool for it, but didn’t get good results. I know ferrules are the professionals’ choice, but I just couldn’t get it to work. I used some basic clamp on metal pieces instead. I really don’t know what they are named, but for the PSU end I used the O-ring style and straight pin for the terminal end on the electronics parts. I used some heatshrink on each end. I did this using some basic tools. The crimp tool was bought in a local hardwareshop for $12 or so. You can see the DC-AC Solid State Relay next to my PSU. I’m going to use this for my AC Silicone heater for the heated bed. I have a small fuse between the PSU and SSR in case something goes bad. Next photo shows how I’ve mounted my 5 extruder-bar (albit mounted wrong here), and also done some of the back paneling, including power connector and off/on switch. It has build in fuses. AC earth is connected to the frame of the printer as well in case some short is happening. I rather don’t like hard-wiring my external components to internal parts, as it is really hard to remove or repair parts, so I set out to make a panel with connectors for each of the extruders. You might spot I have moved up the extruder-bar. I had to do this, or the bowdne output would interfere with the belt running for the CoreXY mechanics. I had planned this, but didn’t look at my plans while executing.. that’ll teach me. Need to find a fitting piece of material for the gap now! In case you wondered what kind of extruders I’m using. I’m using Belted Extruder V3 1,75mm which I desinged myself. I designed them after I tried a wealth of different extruders, but most required special parts, which only the designer sold, or other exotic hard to come by parts. Every single extruder I could find contained printed gears, which I came to dislike, after using them for a while, as they do deterioate, so they must be replaced. Replacing them is not as easy as it sounds, as it really takes some skill and effort to get them perfect. I usually had to print at least 3 to get 1 perfect gear. And my printers are calibrated well. In other words, I wanted to design an Extruder everyone could build. The printed parts are very forgiving if the printer used to print them aren’t perfect, and the other parts are easy to come by and of good quality, like the E3D hobbed bolt, instead of some generic bad quality hobbed bolt, without being overly expensive. I wanted a geared extruder to make it more powerfull and accurate while at the same time having the option to use a small motor to save space and weight. I did not want gears grinding at each other, as it makes noise and are more prone to backlash than aluminium GT2 Pulleys and belts. Why not use E3D Titan Extruders? They are smaller, true. But they weight twice as much, unless you don’t use their recommended motor, and have gears instead of belts. While gears instead of belts might not mean a lot, for most people, the price of Titan is double that of the one I published. Times 5 and it means a lot. I also created mine before Titan was published 🙂 Titan has a genius tract for the filament though, which is awesome! I just have to have some lightning in my printers, so LEDs it is. Some years ago I bought a big roll of leds, which this is the last I’m now using. Really nice to just cut it into fitting pieces, solder them together and attach to your printer or similar. I cleaned up the alu-extrusions using Acetone first before attaching the Leds. I sort of forgot it at first, but remembered I needed some wiring for the planned Panel Due 4.3 touch screen, which I want mounted up top right-side. Using my trusty dremel to cut out a hole for the connector in the panel and also had to cut away small bit of the alu-extrusion to make room for it in there. I used some shielded 4-wire cable I had, which were perfect for this. You might noticed it above – handles! After adding the extruders the BeTrue3D printer got rather heavy but was ok to lift.. untill I put on sidepanels, which left me nowhere to to grab onto it. I sawed a handle on each side, and aligned the holes up with the lower top-alu extrusion to give me a good grib. 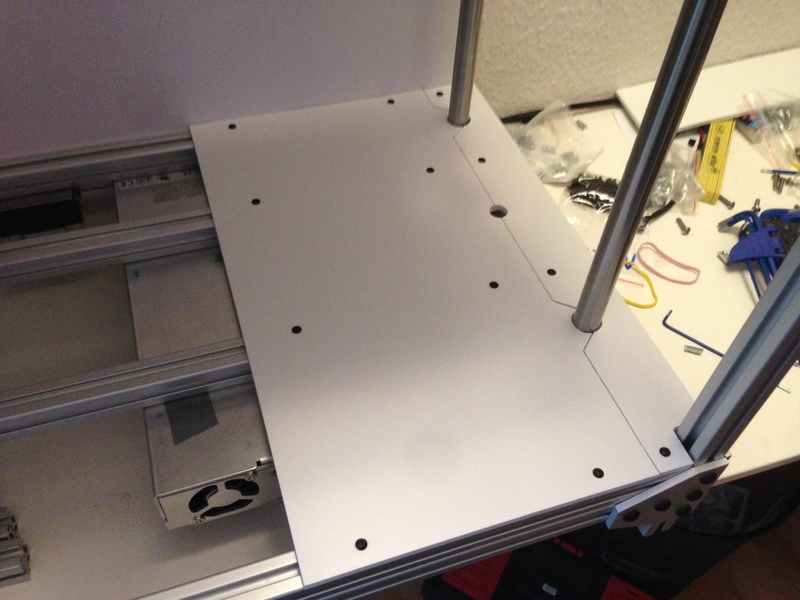 The panels holes are 1mm above the alu-extrusion and I’ve rounded the cut to make it comfortable to use. I’m waiting for the new printbed from clever3d.de, and also the Y sliders. I am also waiting to recieve the 5 new heatsinks from reprap.me, which I hope to get any day, so I can plan a carriage for it. That’s it for now, so have a good one untill next time.